Investigators think they've uncovered a key clue that will lead them to solve the mystery of what happened to legendary aviator Amelia Earhart, who disappeared on a trans-Pacific flight 75 years ago. Ric Gillespie, executive director of The International Group for Historic Aircraft Recovery (TIGHAR), said a new enhanced analysis of a photo taken on the Pacific atoll of Nikumaroro, formerly Gardner Island, three months after Earhart and navigator Fred Noonan disappeared, may show the landing gear of her Lockheed Electra protruding from a reef. “We found some really fascinating and compelling evidence," Gillespie said at a news conference in Washington on Tuesday. “Finding the airplane would be the thing that would make it conclusive,” he said. 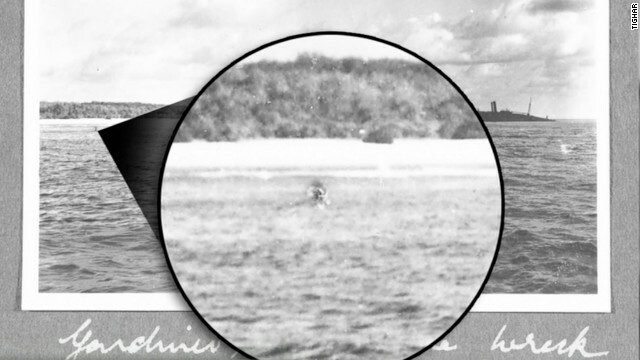 Gillespie said the photo was taken by a British survey team in October 1937 and had been seen by Earhart researchers many times. But investigators took a new look at it in 2010 and, when their suspicions were triggered, had the photo checked by U.S. State Department experts. In a blind review, they determined the component in the picture is the landing gear of a Lockheed Electra. "This is where the airplane went into the drink," Gillespie said. On July 2, 75 years to the day after Earhart was last heard from, Gillespie will depart Honolulu on a University of Hawaii research vessel to try to find that plane in the deep waters off a flat reef on Nikumaroro. The privately funded effort will use robotic submarines from Phoenix International, the U.S. Navy's primary contractor for deep ocean search and recovery, to comb the area. The Discovery Channel will film the exploration for a TV presentation, Gillespie said. Gillespie acknowledged there would be skeptics after his 23 years of searching for Earhart had yet to yield an answer. “There are some very smart people who think we’re wrong about this, but there are some very smart people who think we’re right about this,” he said. One Gillespie supporter is Robert Ballard, the explorer who found the Titanic and other deep sea wrecks, who called himself "a ringer" brought in to vet Gillespie's case. Ballard said he had rejected offers to look for Earhart's plane, thinking the task too difficult. “If you ever wanted a case of finding a needle in a haystack, this is at the top of the list in deep sea exploration,” he said at the Washington press conference. Ballard said he did a strict analysis of Gillespie's research and signed off on the science. "Every time he passed the test," Ballard said. "Clearly the smoking gun was the analysis of that enhanced image." Earhart and Noonan disappeared while on a flight from New Guinea to Howland Island that summer of 1937. The flat reef off Gardner Island, 300 miles off their course, had been a suspected landing spot. But those suspicions were largely based on speculation. At Tuesday's press conference, Assistant Secretary of State Kurt Campbell called the disappearance of Earhart "the last great unsolved mystery of the 20th century." If the mystery is solved this summer, Earhart's aviation trailblazing will have played a part, Secretary of Transportation Ray LaHood said. "In no small part because of Amelia Earhart our world is smaller," LaHood said. "This very voyage to recover her remains in some ways is doable because of Earhart herself." “We take a special measure of pride in an expedition that is as enterprising and inspiring as the woman with which it will unite us,” he said. Secretary of State Hillary Clinton saluted Earhart's memory, too. They said' we found a part of Amelia Earharts plane. Amelia Earths? Very interesting history. Amelia Cervantez was my grantsmother mom. She was born in Spain some time on 1937. I share part of my life with brave Amelia Cervantez, this happen at the Pacific Coast of Michioacan Mexiico. More or less on 1969. I mist Amalia, a Lady who teach me how to survive. Be on Peace Amalia . What is that figure in the water if you go straight down from the big rock on the beach. It looks like someone walking in the ocean near the plane??? the figure in the water is the Loch Ness Monster. If you want to find Amelia Earharts plane, just call John Cameron. I think he's looking for something to do.